Celebrate life on two wheels with Dallas Bike Ride! The second annual Dallas Bike Ride will take place Saturday, November 3, 2018. 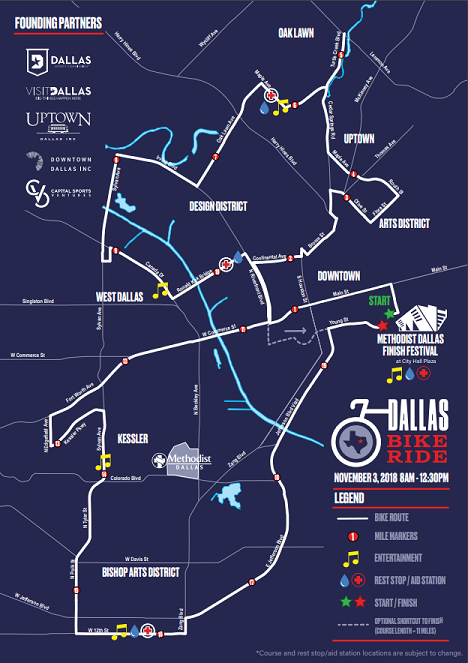 Dallas' only 20-mile, closed road, car-free, recreational bike ride, Dallas Bike Ride is open to all ages (3 and up) and all riding abilities. Starting and finishing in front of City Hall Plaza, the course will feature 20-miles of car-free Dallas streets, diverse neighborhoods, skyline views, on-course entertainment, and a post-ride Finish Festival with live music, food trucks, and family-friendly activities for all to enjoy. Bike rentals, complimentary bike mechanics, and packet mailing are available. Every registrant will receive a Dallas Bike Ride water bottle with their registration. For more event information, click here. If you have any questions, email us at hello@dallasbikeride.com.